Tommy Wright will “mix and match” his Corby Town squad for tonight’s (Tuesday) NFA Hillier Senior Cup first-round tie at Kettering Town. The Steelmen boss will include a number of his first-team players in the side at Latimer Park but the likes of Ben Milnes, Ashley Sammons and captain Cleveland Taylor will all be rested ahead of the FA Cup second qualifying round clash with Rushall Olympic at the weekend. Wright is keen to give his players a boost in confidence following Saturday’s 3-0 home defeat to Worcester City - their third successive loss in the Vanarama National League North and their sixth game without a win. And he insists those who play will be expected to put things right. “I have had a good chat with a few of the lads and some of them are desperate to play because they want to put things right after some disappointing performances,” Wright said. “There are those like Ben Milnes, Ashley Sammons and Cleveland Taylor who have done enough and will be grateful for the rest. “It will be a bit of a mix and match side but those who feature will give the opposition and the fans the proper respect by going out there to try to get a positive result. “I would rather have made this game an educational one for the academy boys but that’s not the way it is now. We have individuals who need a game and need a good performance. “If we do get through then we will assess the next round when we get to it. Wright, meanwhile, was able to deliver slightly more positive news on Greg Mills. 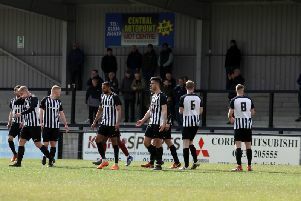 The frontman left Steel Park on crutches after Saturday’s defeat but the Corby boss has now revealed there is an outside chance Mills could be fit for the FA Cup tie with Rushall. “It looks like it isn’t as bad as we first feared,” he added. “We think he has just sprained his ankle so we we will see how he is after a bit of light training on Thursday and then we will assess him again on Saturday. “All I saw last weekend was one of my best players leaving the stadium on crutches so it was difficult to know how he would be.